Grov loose snus is a robust and well-rounded snus with a strong tobacco flavor and a subtle smokiness. Grovsnus is considered the standard for a tobacco-centric tasting snus. 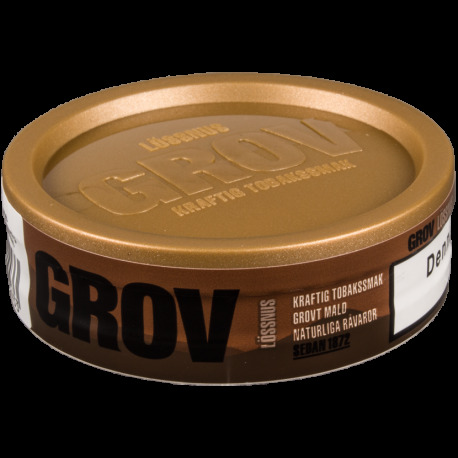 If you love the taste of premium tobacco without a lot of other flavorings, Grov is the snus for you! Like all our snus, you will always find FRESH Grov Loose Snus at SnusCentral.com; YOUR home for Swedish snus! Not everyone likes Grov, which means not everyone likes tobacco. Folks, this is tobacco flavor. Sure I like bergamot or the occasional drop of rose oil, but what i like most is tobacco. This is the real deal, and a must for smokers who enjoy maduro cigars and English blend pipe tobaccos. My desert island snus, and nothing better complements strong coffee, good craft beer, or a quality single malt. A comfortable three gram prilla keeps me happy for two or three hours. The stark portions are also great! Plus, Mikkey from Motorhead/King Diamond uses Grov, and legend has it he was using it when recording "Abigail". There is no better endorsement! Decent product. As mentioned below by a reviewer, however, this does seem to be an attempt at giving a 'cigarette' flavor to a snus. I can't really see the appeal, but I guess others might. Another reviewer mentioned that it is very similar to Copenhagen Snuff; I've never tried that product, but the same principle applies, imo. Why try to emulate something already done? The comparison to Ettan, I find egregiously misleading. They're both snus - I guess that's a similarity, but it ends there. This is grittier than Ettan, so perhaps the Snuff remark is closer to the truth. It's not as moist as I'm used to from any snus - my can arrived fairly dried out. I've never had a can of Ettan this dried out... It was within date, however, so I am assuming it was meant to be so. The product loses flavor in about an hour; usually I can still enjoy the flavor of Ettan/General for around twice that, even if it's not still supplying a nic hit... Overall, I find this a tired imitation, trying to be too much, and failing to excel in anything. It's adequate, but at this price, one would expect more. I bought the "Ice Tool special" with 20 cans of loose. I first and to look over the "Ice Tool" I though this looks extremely to use. So I tried it on the only loose Snus I haven't tried before "Grovsnus Loose Snus"
Whoa!!!! What a shock! It's extremely smooth and packs very easily with the "Ice Tool"
My Biggest surprise was the taste Fresh, Smooth, a very true Tobacco taste and very easy mouth feel. I found myself enjoying this Grovsnus very much! I shall never go without it. I found room in my Humidor. I will always have roll of this very special Snus in my collection! Simply enjoying! Very good stuff. The closest thing to cigarette tobacco flavor. Very smokey and present tobacco taste. Juices even burn the throat a bit when you swallow. It's almost as if they took cigarette tobacco and made it into a snus. No distinctive flavors that become present as you continue to taste it. It's a purely more harsh tobacco flavor that stays strong throughout its usage. I love this snus, it's a more flavorful and stronger taste than Ettan. Definitely a snus that can be used on a daily basis that leaves you satisfied. If you're looking stay away from the flavored stuff and want in your face tobacco flavor, Grov is you best bet. If I had to pick one snus for the rest of my life, this would probably be it. The portions are also wonderful. This is a very simple, strong (in flavor) snus. Coarse-ground tobacco, salt, water. That is the flavor - lots of salt, lots of tobacco. Beginners may not like this. It's similar to Ettan, but just a bit different, and in my opinion, a tad better.